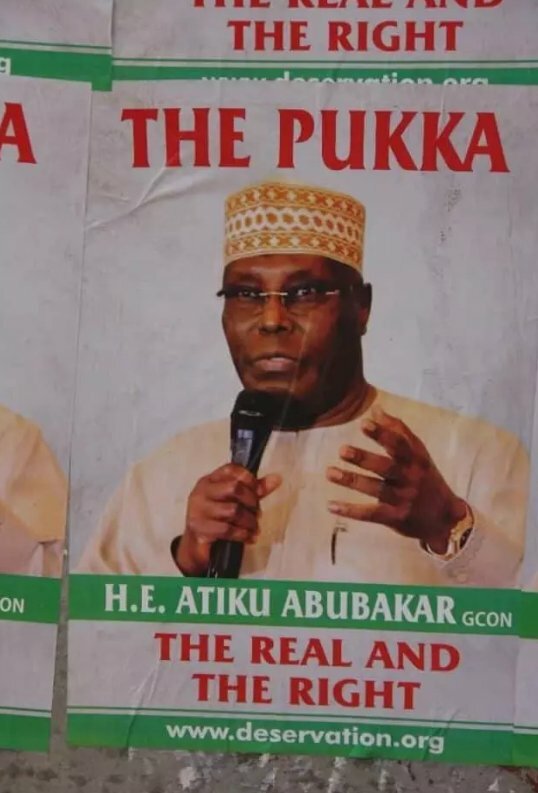 Naija News has sighted fresh posters of the Peoples Democratic Party presidential candidate, Alhaji Atiku Abubakar in certain streets of Abuja which has already generated reactions from the presidency. The posters, which surfaced in the Federal Capital Territory yesterday, also bore ‘Pukka’ a Hindi word, which literally means ‘Genuine. This online platform recalls that Lauretta Onochie, the presidential aide on social media, had taken to Twitter to reveal that she returned to Abuja on Tuesday to see Atiku’s fresh posters carrying treasonable inscriptions. She said Atiku should be glad he is working free, rather than treading paths that may land him in jail for treason. Recall Atiku contested for the office of the president against Muhammadu Buhari of the APC and other candidates in the 2019 presidential elections but lost out to the eventual winner, Buhari as officially declared by the nation’s electoral body, INEC. He however rejected the results and promised to seek redress in court.